A lot of readers and followers ask us how we managed to travel for so long and so often. To be honest, there isn’t a big secret or formula for this. The answer is quite boring actually: we worked and saved money and then we left. So yes, of course you need a job to save money, but it’s really not a must to have a high paying corporate job in order to save money. We both didn’t have a very high paying job, I mean I didn’t even work full time. But we both made travel our priority and made sure it worked out. In this post we give 10 tips on how to save money for travel without a high paying job. There are actually two budgets you need to make: one for during your trip (so you know how much money you need to save up before you go) and one for back at home. The minute you decide on travelling, whether it’s for a longterm trip or a vacation, make a calculation. Decide how much money you need each week or month that you’re away. This amount really differs per person and the way you travel. During our trip we had a budget for 60 euros a day. This is 30 euros per person. We managed to use this budget in relatively cheap destinations such as Vietnam and India, but also in relatively expensive destinations such as Korea and Japan. Of course some days we spent more than others, but we always tried to balance this out. By creating this budget you know how much money you need to save in total. So you also know how much you need to save up each month. Now that you know how much you need, you can start with creating a budget for at home. Yes, even before you start your trip, you already need to start living on a budget. At home you have your fixed expenses such as rent and utilities. Then you have your groceries, phone bills and internet bills. Make sure you only spent on things that are really necessary. Calculate how much you expect to spent each month. Give yourself a manageable budget for at home and stick to it. Make sure you do have a little room for unexpected costs, but most importantly: don’t be too flexible with your spendings. Of course, sometimes it’s just necessary to spent a little more. But a new dress for a special occasion really isn’t an unexpected cost. You don’t need to buy it, so don’t. Now you’ve managed to make a budget, you can also calculate how much money you can set aside for you trip. Try to make a set amount and automatically transfer it to your savings account each month. Of course, it’s a bonus if some months you can even save a little extra. Instead of going out for dinner each week, have friends over. Restaurants can be really expensive. Why not invest your time in getting better in cooking? Groceries are a lot more affordable and often you can create a delicious dinner for a great price. I would suggest to not eat out at all anymore, but I understand that once in a while it’s great to have a little break of eating in. So if you do go out for dinner, choose a more affordable place. The same goes for breakfast and lunch of course. Instead of going out for breakfast and lunch each day during work, bring your own. Yes, I’m a buzz kill. But if you really want to go travelling, you need to make it your priority. It’s really a matter of what you think is more important: partying all the time or making the trip of your life. When you’re really keen on partying, party occasionally and definitely not each week. This is the time to stop smoking and drinking. It’s an expensive and unhealthy habit anyway. Again, it’s a matter of priority. Is smoking or drinking more important than travelling? There is really no need to go out to the movies. The holy internet can offer you any kind of entertainment you want. How do you spent your money? Some people don’t even realise that they spent their money on a lot of unnecessary things such as: drinking a fancy Starbucks Frappuccino each day, smoking cigarettes, drinking alcohol, buying a lot of clothes and make up, eating (unhealthy) snacks, going to the hair dresser each month and so on. Do some of these things sound super important to you? Well, I’m here to tell you there aren’t. Start tracking your spendings for a whole month. Then, decide for yourself which things can go. And be brutally honest to yourself. It’s okay to look a little less fashionable for a while. Which grocery store do you shop: the cheap one or the expensive one with the best service? And do you always choose the cheapest variant of a product? There is always a cheaper option. Of course, sometimes it’s necessary to buy a more expensive product to stay true to your principles (such as free-range eggs), but often you can shop the cheaper option guilt-free. For instance, if you really need some new clothes, do you buy them second-hand or from a luxurious department store? Okay, I love the gym and I didn’t quit my subscription there until I actually left the country. But if it’s really not necessary, get rid of it. You can go for a run instead of going to the gym. And do you really need a membership for that magazine? If you’re planning on travelling full time, you should try to sell anything you can. Do you have a car? Sell it. Do you have a home? Sell it or rent it out. If you have a lot of shoes that you can’t take with you on your trip, sell it. If you’re serious about selling your home or perhaps you already want to rent it out while you’re still in your home country: see if your family can help you with a place to stay. Perhaps your parents are nice enough to let you stay there the last few months before you’re leaving for your trip? Are you already working full time? Great, but perhaps you can make a little more money on the side. Think of babysitting, selling your crap on flee markets, walking dogs, taking care of cats. Every little penny helps! If you want to travel without a big savings account, it might be an idea to see whether you can start making money online. Take a look at your skills and see if they can be applied to online work. Are you a graphic designer? Great! Plenty of opportunities online. Can you write, translate or teach? This can all be done online! Start working on your possibilities as soon as possible. 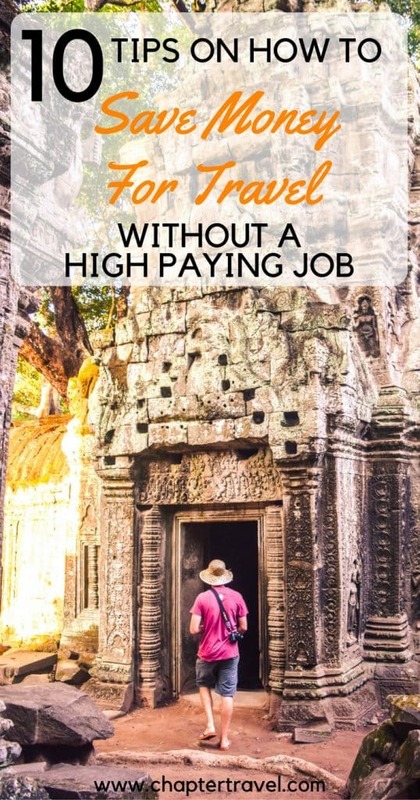 These were 10 tips on how to save money for travel without a high paying job. It won’t be easy and sometimes you’re worried it’s all for nothing. But if you really want something, you will make it work. Just remind yourself why you are making all these sacrifices each day and you’ll get there. As someone who loves saving for trips and future expenses (I seriously spent my birthday doing our finances and had a blast), I thoroughly enjoyed this article. Based on my experience and lifestyle you hit everything I do, while offering a few extra tips! Great helpful post. Travelling the world is definitely possible even without having a highly paid job, Jeffrey and Lisanne. Your tips are truly helpful and practical. Perfect timing with this post! I left a high paying job for one that I love a few months ago, but I’m really struggling to come to terms with the fact I can’t just book things when I feel like it now. I’m going to take your advice and make a budget – I just hope I stick to it! Awesome tips, especially picking another side job. One never know how many options are there until they explore. Great tips on cutting down the money! 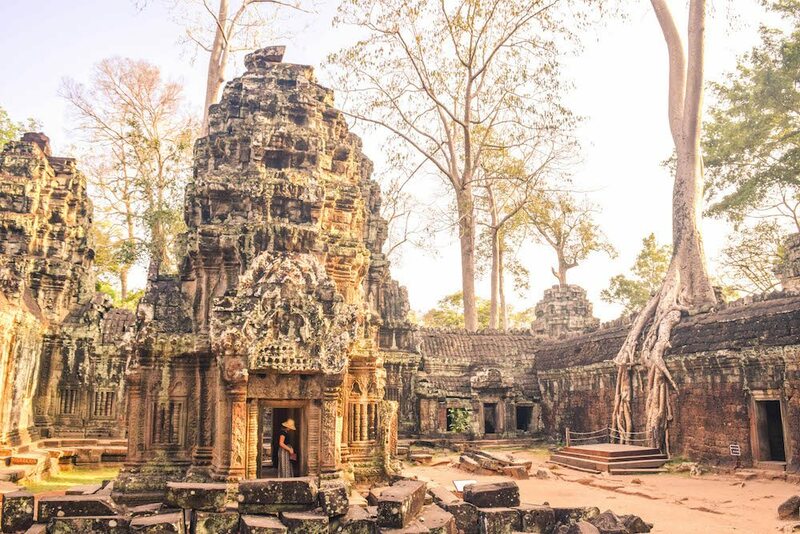 I have been travelling fir a year now and everyone asks how I do it – it isn’t as hard or even as expensive as people think it is! You did a great job in summing up some of the main points! Useful tips.. Stop unnecessary subscriptions is the first thing I did..
Agree with all of this! It’s about prioritizing what you spend your money on. Like instead of $50 mascara, I buy drugstore brand! If you value travel, you can usually find a way to make it work. This is such a wonderful post worth of tips that I’ll need to help me survive more travel opportunities ! Good tips! I can not stress enough how important it is to track your spending. Where there is a will there is a way! Great tips!! I’m working on cleaning/selling things now. It’s a bit of a headache, but I’m sure it’ll be worth it.